Neil Shanahan was 13, a tall lad for his age, when he positioned himself comfortably into the first motor he ever owned. Two years he had waited for this moment. Two years of setting aside all pocket money for this day. The occasional evening helping in the bar and the hours spent wondering if he would ever have enough. All of this for one moment behind the wheel. Dad had promised as dusk fell on that first trip to Mondello. Watching each kart lap the track was a glimpse into Neil’s own future. Everything he wanted to do was crystallised in a single afternoon. Liam agreed with his son. A kart could be his provided he came up with half the money. It takes determination to follow dreams. This took two years. Sometimes he felt like giving up, but the dream sustained him. The pennies began to stack. Into pound after pound. Two years, almost there. His father impressed by his son’s will, put up the rest of the price. At last, Neil was karting. He stepped slowly at first. Learning is the most important part. Other drivers oozed experience, understood the rigours of competition. It was all something fantastic to Neil. Glimmers of potential did flicker sporadically, but the education curve was long. All of a sudden 1996 was the year. Third year in a kart, second place in the overall rankings. Most improved driver award. People were beginning to notice. Time for a further step forward. Bigger vehicles. Bigger stage. Neil always knew he was meant for cars. Karts were fun, a bit of craic, but when he moved into real motors then things would evolve. Someone had mentioned the name Mick Merrigan to Liam as a possible mentor. Father and son sought him out. Mick, taken aback by the determination and professionalism of the young driver, accepted the role immediately. Neil knew he would come of age in the car. And how right he was. Into Formula Ford Neil ventured, his parents and Mick Merrigan by his side. Not even in the wild delirium of insomnia could Neil imagine the success that awaited him. Only once in the eleven races of his rookie season, did he fail to take the chequered flag. The jaw of the racing community plunged. Cynics dismissed the results. No one could be that good, that much beyond their years. Others questioned the legality of the engine. There is always a need to dissect raw talent. Most were in no doubt, though. This was the best driver currently on Irish tracks and he was awarded the very top prize accordingly. The Sexton Trophy tells you that you are the best. It told Neil Shanahan at only 18. And again, the following year, when he did to Formula Ford Zetec what he had done to Formula Ford. Neil was maturing so fast, more challenges had to be found. 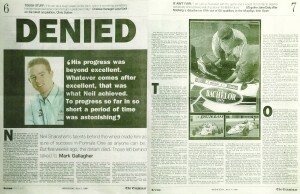 “There was nothing left for Neil to do in Irish motor racing. Keeping him in Ireland for another year would have only held him back,” said Mick Merrigan. Van Diemen and the British Formula Ford championships were mooted. There was already a Van Diemen engine on his Zetec, but at his age to drive for Van Diemen. An unsurpassed feat. Van Diemen are the Ferrari for Formula Ford. In his youth, Eddie Irvine began his long road to F1 there. More significantly, so did Ayrton Senna. The God. The greatest there ever will be. Neil Shanahan was to become the latest to join that lineage. In three short years. Mick Merrigan hasn’t the words to describe his rate of progress. “His progress was beyond excellent. What ever comes after excellent, that was what Neil achieved. To progress so far in so short a period of time was absolutely astonishing,” says his mentor. And there is a tendency to agree. He made his British debut in Donington, back in April. Qualifying third on the grid, by the second lap, he was in front. However after being forced off the track, he had to settle for fourth. An impressive debut in British Formula Ford and people were beginning to notice more and more. The number of watchful eyes continued to grow until five weeks ago in Oulton Park where the dream tragically ended. The phone calls haven’t stopped. Unknown voices of empathy. Derek Warwick took time out to ring. To offer condolences, proffer advice. He stayed on for over half an hour, explaining how the same thing had happened to his brother, Paul. How he got through it. Each day the computer mailbox is emptied. Thousands and thousands of sympathetic words from all over the globe. Each morning they arrive through technology. Tributes flow from every coast. Monza held a minute’s silence. Tracks all over the island did the same. Michael Keohane, rival and good friend, wore Neil’s name on his helmet for some races. They will continue to flow, as the memory of that terrible Sunday in Oulton Park become blunter. It makes a little difference though. In this time of only questions, it is too hard to understand. You may never truly understand. For now, it is all shaken heads and stunned silences. Life is clothed in the surreal sense of a continuous nightmare, as if you are going to wake up one morning and Neil will be there, home from Norfolk for a few days, waiting for opportunity to see his pals. “Maybe someday we will know why Neil was taken from us,” his mother Mary says. Until that day, though Mary and Liam will have to keep wondering. Wishing. Small consolation is derived from the memories each one as golden as the other. But that is all there is now. Memories. In the room which houses the many prizes of Neil’s short career. In his bedroom, where the colour of the wall is distinguishable because of his love of motor racing. The gold of Jordan lies against a blackened backdrop. Pictures of Senna, Berger and Irvine decorate the wall. Images of Neil’s aspirations. A future that will never be fulfilled. Beside the Play Station where Neil would pass hours between races, sits a can of Red Bull. After each race, Neil’s parents would present him with the energising drink to quell exhaustion. This particular can was what Liam held inside his pocket, the day of the tragedy. The room will always remain the same. A reminder of what Neil was. What he could have been. Neil can now only ever been seen through the prism of memory, but what a clear vision that is. Like the holidays in Wexford, when Neil first drove. “We used to stay in this farmhouse in Wexford, when Neil was small,” Liam recalls. “There was a long drive up to the place, but when Neil was around seven or eight years of age, he used to drive the car up, and through the two tight pillars in the drive.” From an earnest start in a farmhouse in Wexford, the seeds of a dream germinated. Neil had always an avid interest in cars. On family holidays to Scotland in his early youth, about the only thing he would pack was miniature model cars. His entire life revolved around the whizz of an engine, the traction of the rubber. Everything else paled. “Even when he was very young, he was able to tell the difference in the feel of a car. If I ever changed a car, Neil would always tell the differences between the two, as a passenger,” Liam relates. So, he really couldn’t have been anything else other than a racing driver. Presently, that is hard to accept, only distance will show it. Before that first day out in Mondello, the plot of his life circled around four wheels. Mondello just consummated the drive. The years in the karts only stimulated the appetite. He was fifteen when he sat in his first real racing car. An unforgettable experience. Ring also played an unwitting role in Mick Merrigan’s discovery of how true Shanahan’s talent was. It was a soaked Mondello and one of Neil’s first practice runs. Shanahan’s parents allowed him to pursue his dream as far as it took him. Neil was never interested in school. His parents didn’t mind. As long as he did the leaving certificate, he could concentrate on the motorsport world. If his promise failed to deliver, there would be the qualifications of the leaving certificate to break the fall. Ensure he could go to college. “I was left to fill in his CAO form on the last night before it was due in. So I was sitting at the table in the kitchen, filling in the form when Neil came in. I asked him what courses he wanted to do. He said he didn’t care,” Mary smiles as she recants the story. For Shanahan school was St. Mary’s in Rathmines. A rugby school where every other sport is considered minority and motor racing is not even considered. Because he sprouted early, Neil was involved in the rugby sides for a couple of years. By Junior Cert, he was single-minded in his sport. The ruck and maul was murked by cars. Nothing but cars. Transition year provided him with another outlet to nurture the goal. Placement in a local garage, where each evening, it was Shanahan’s duty to park cars in the forecourt as darkness fell. The placement developed into summer work. Neil’s life was focused on cars. “He used to come home every evening and tell us all the different types of cars he was driving during the day, he loved the job there, and was only too pleased to use the garage’s name when he started to race seriously,” Mary recollects. Once across the channel, the serious intent began to build in Shanahan. Settled with a Tipperary family in Hunstanton, Neil was in a home from home. Every need catered for, he would relax each evening in front of South Park. The illustrations of Cartman on the nose cone of his car reminding everyone of his love for that show. Unlike his first days in karting, the sheer awe of it all no longer frightened him. Two laps into the latest stage of his career and he was leading the field. The promise shown at Donington had English tongues wagging. This Irish kid was good. Although driving in the next two races, Shanahan found the course difficult, they were deemed aberrations at Brands Hatch, Neil was recognised as Motoring News race ace, after finishing fourth from a starting place of 10th on the grid. There was a palpable buzz around the name. America was mentioned. But, Mick Merrigan says that only one of the options open to Neil. Van Diemen had a team in the States, and there was some talk of Neil trying a season or two over there. Somewhere down the line, he could have been in Indycar rather than Formula One. Of course, Formula One was always the dream. Now, because of a freak accident on Oulton Park, we will never know. For Neil’s family, the only sustenance comes in memories, portrayed images on the walls and the trophies. The roomful of trophies. As a tall 13-year-old, Neil stepped into a kart, with only a handful of dreams and the assurance this was what he wanted to do. In under seven years, he became the shining light in domestic racing. His star could have shined brightly and long. Alas we will never know.